Our 20+ years of engineering and testing provide the strongest anchoring system top to bottom. 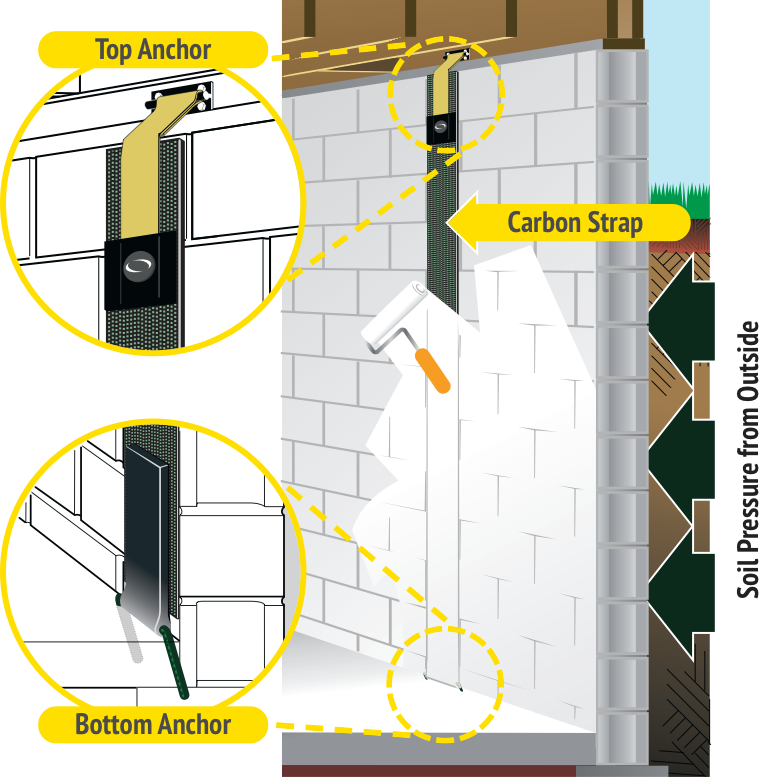 Fortress was the first company to develop a top-of-wall anchor for basement wall repair. The Fortress top anchor is post-tensioned after installation. This ensures that the top anchor and wall are engaged under tension, and holding fast, when the job is complete. No other company has a post-tensioned wall anchor. Bolting to the rim joist is safer. The sill plate is not adequately connected to the floor joist to carry the load. The Fortress top anchor is mechanically fastened to the rim joist, not the sill plate. By connecting to the rim joist, the Fortress top anchor engages the building’s floor system, providing a stronger, more durable anchor. This prevents any movement of the basement wall. Many older homes do not have enough sill plate-to-foundation wall connections to ensure that the sill plate will hold under stress. Engaging the floor system (first story floor to top of basement wall) provides the strongest, safest connection. The best bottom anchor in the basement wall repair industry. The quality of the bottom anchor construction is very important. Because preventing shear requires strength, we made our bottom anchor over 5 times thicker and 125 times stiffer than the competition. In addition, we make sure that the connection to the foundation is absolutely secure. We use a dual leg solution with specific contact lengths engineered to achieve a 200% safety factor. Our bottom plate anchor is the best in the industry. The Fortress bottom anchor secures your wall from shear slide. 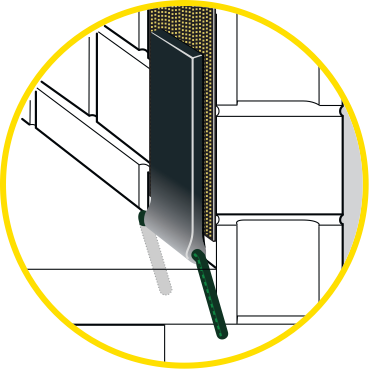 Shear slides can occur at the bottom of masonry walls where shear forces are greatest. This inward movement of the wall is defined as shear. In typical situations the basement floor holds the bottom of your wall from moving in, but where there are excessive shear forces, the Fortress bottom anchor is needed. The bottom anchor uses the basement floor to secure the Carbon-Kevlar strap and prevents shear slides. The bottom anchor is used in both block and poured concrete walls. The best solution for bottom-of-wall anchors. 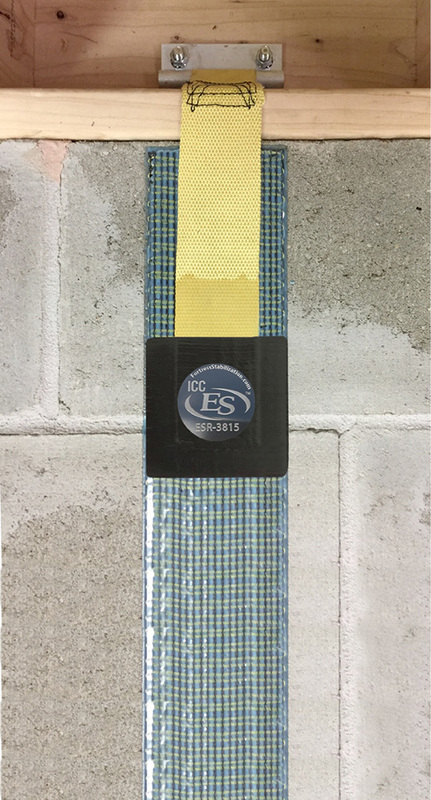 The Fortress bottom anchor takes the proven American Concrete Institute recommendation for anchoring carbon fiber straps and makes it better. What goes into the Fortress Carbon-Kevlar strap? Not all carbon fiber is created equal. Before considering another carbon fiber system, ask how their fibers are arranged. Conventional manufactures commonly weave the carbon. This produces an attractive woven pattern, but this method also crimps the fibers while going over and under each other. When force is applied to a woven pattern, the bent fibers try to straighten out, which reduces effectiveness. You can see that it’s done right. Fortress has always been concerned with having the best composite performance. All strength in fiber composites is gained when the fibers are straight. Unidirectional fibers lay flat, eliminating flex when force is applied. The unidirectional method Fortress has developed creates a product twice as strong as products using woven carbon fibers. This Fortress propriety manufacturing process allows for a true unidirectional carbon product, which is the perfect tool to reinforce foundations. The Fortress open grid technology (OGT) combined with epoxy rivet technology (ERT) connects to the carbon grid to form a mechanical bond to the wall. Epoxy rivet technology forms an adhesive bond between the grid and the masonry substrate which load to the carbon fiber, creating an adhesive bond as well as a mechanical “rivet” between each fiber of the grid. There are over 8,000 epoxy rivets securing a single strap to your wall. OGT and ERT are exclusive to the Fortress system. Ready to get your basement wall permanently fixed? Contact us and we'll connect you with a Fortress-certified installer who will get it done right. Patent Numbers 7743585, 7823354, 8142102, 8367569, 9034775, 6746741, 6846537, RE39839, 9528286, 9290956, 9290957, 9790697, 3040496. Additional patents are pending.